As experts in metal finishing services including electroless nickel plating and diffused nickel plating, we carry out metal plating for a variety of industries all over the world. Last year, we shared the news that the water well we sponsored for AquAid had been built and was in full working order out in Africa. Our relationship with AquAid remains the same; they do an excellent job of supplying the us offices with water coolers, so we decided to go ahead and sponsor another well. We were really pleased to learn that our last well made a huge difference to people’s lives in that village, so we decided to continue with the good work. Obviously, we are very proud to be associated with such an amazing project, and delighted to be able to make such a difference in the lives of those less fortunate. You may have noticed that we have a badge of support on our website, to let people know about this great cause, and show our commitment to helping Aquaid’s recent project installing the elephant pumps in parts of Africa. Who are AquaAid and What Do They Do? Aquaid raises funds to build fresh drinking water wells in areas of Africa where it is needed the most, such as schools and villages. And for every water bottle that we get from Aquaid for the us offices, a donation is made to the The Africa Trust. 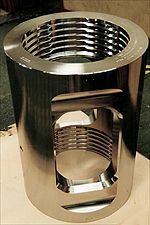 For more information about us and the metal plating services that we offer, including electroless nickel plating, diffused nickel plating, and copper plating, please call us on our phone number, email us at info@metal-finishing-company.co.uk or visit the contact page on our website to make an enquiry. Our AquAid badge of support can also be viewed on the homepage of the us website. We are pleased to announce the installation of a new, ultra-large plating line at our metal finishing and plating factory in Chesterfield, Derbyshire. This will be our 6th nickel line and has been designed to accommodate very large pieces of up to 12 metres long and 3 metres high. 2014 was a busy year for us when we closed the deal on a funding boost that allowed us to expand our nickel plating services. As leaders in the market place for providers of electroless nickel plating services, we were really pleased to be able to expand our capabilities and production capacity. And this new, large nickel plating line will expand our services even further! Here at us, we have more than 30 years of experience specialising in the electroless nickel plating process and we also offer a variety of other surface treatments. Just last year, we expanded our services to include nickel PTFE plating, nickel diamond plating, tin plating and nickel boron plating, in addition to our already well established services of diffused nickel plating, copper plating and electroless nickel plating.